Buffalo Chicken Mac and Cheese is a great dish that is super easy to make in your Slow Cooker! Everyone loves this spicy and savory dish for dinner! Time to pull out your crock pot. Buffalo Chicken Mac and Cheese crock pot. This Slow Cooker Buffalo Chicken Mac and Cheese came from me wanting an easy meal, and my kids request for macaroni & cheese and something spicy. My daughter is a mac & cheese fanatic and my son loves anything spicy. We have a BIG problem in our house……if it was up to my daughter she would have mac & cheese every day of the week (SERIOUSLY every day). To please us of all I decided to whip up some homemade mac & cheese in the crockpot. Buffalo Chicken Mac and Cheese is a great easy meal any time of year. It’s perfect for winter days when you want a warm meal and summer days when you don’t want to heat the house up turning on the oven. It’s ideal for a fun game day party since buffalo chicken is such a classic party dish. Start with diced chicken and season while cooking in your favorite non-stick skillet. You want to get the chicken browned and cooked through before adding to your slow cooker. I recommend spraying your slow cooker with non-stick spray before mixing this buffalo chicken mac and cheese. It can easily stick to the edges, so this helps clean up a lot. Mix everything together well. You want the cheese and sauce well distributed so the pasta cooks evenly. You can check on this and stir occasionally as it cooks, but if you need to leave it while you go out, it will be fine without being stirred frequently. Serving this buffalo chicken mac and cheese up for dinner is an easy one-dish meal that everyone loves. I add a side of vegetables or a side salad with some blue cheese to add some freshness. 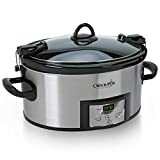 Here is a great crockpot offer, if you don’t already own one. 16oz. pasta of your choice, shells are fun! or rotini, of course, regular elbows work! Heat a drizzle of olive oil in a skillet over medium heat, saute the cubed chicken until nice and brown on the outside. It will finish cooking in the slow cooker. Add the dry ranch packet to the chicken, mix well. Plug the slow cooker in and set it to high. Stir in the milk, cream cheese, cheddar cheese. Allow this to warm for about 10 minutes. Mix again. Add the uncooked pasta, buffalo sauce, chicken and a pinch of salt & pepper. Stir all the ingredients together so that all the pasta is coated and covered by the milk. Place the slow cooker cover on and set to low. Cook for about 3 hours. Well – giving this a whirl tonight for a gathering tomorrow. I used a 8oz block of Monterey Jack plus 8oz shreaded Cheddar Jack rather than cheddar or Velveta. Chicken was Tyson Grilled & Ready frozen diced chicken. And Sweet Baby Rays Creamy Buffalo sauce. Pasta was Medium Shells! We will see – I will report back. Yes, I would love to know too. I also have swap out the velveeta and used cheddar, But have added a scrambled egg, extra milk with flour to make it smooth. I bet it tasted great! Does the cheese have to be fully melted before placing chicken, noodles and buffalo sauce in? It doesn’t necessarily. You see it will all eventually melt.